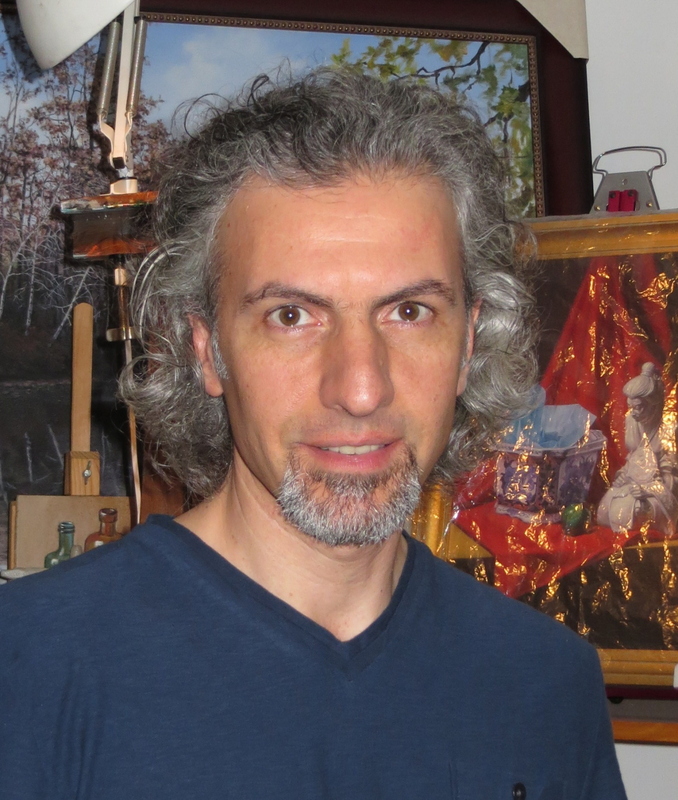 Mario Giuseppe Santoro is a self-taught artist with a sincere passion for fine art. Born in Foggia, Italy, he has been a New York resident since 1988. His work reflects his eclectic personality, ranging from realism, cubism and modern art. Some of his commission work includes a series of cubism original paintings, created between 1996 and 1997, displayed at Cafe` Picasso in Williston Park, New York. During 1997, he also worked on 4 large paintings depicting an imaginary galaxy, commissioned and displayed at Cafe` Portofino Beyond 2000 in Huntington, New York. Since then, force-taken by financial reasons, in exchange for a more stable and steady income, Mario began working as cake decorator, his time to paint was greatly reduced, and for about a decade the art supply was stored away. The desire to get back behind the easel and improve his art skills, was finally made possible in 2007. Mario attended some classes at The Stevenson Academy Of Fine Arts in Oyster Bay, New York. For a short term, guided by the founder artist Attila Hejja (well known for his outstanding illustration works done for NASA, the Air Force, and Grumman Corporation, just to name a few), he studied the fundamentals of drawing and oil painting based on classical methods. Due to the sudden death of Mr. Hejja, Mario continued to take some classes in classical figure studies at the Long Island Academy Of Fine Art in Glen Cove, New York, taught by the artist Robert Armetta, founder of LIAFA. The opportunity to paint again came about thanks to a call for artists to paint live while live music performed in Live Art Fusion events on Long Island, NY. At present time, Mario continues working with fondant, chocolate and other bakery ingredients creating special occasion and custom cake designs. Thanks to his father who once was a pastry artist himself, Mario at a young age was able to learn the basic craft and use his talent in the pastry artistry as well. Most recently he has participated in group and solo exhibitions in Huntington, New York, where he resides with his wife and two daughters.